Pancho Villa‘s rebels are coming! Carry what you can and flee – or be killed! So much for 13-year-old Evangelina to cope with now – a girl trying to steal her suitcase on the train (with grandfather’s secret box inside! ), store signs in the Texas town that say “No Mexicans” (where can they buy food? ), and wondering if they can ever go home to Mexico (is anyone safe there?). The story is set in 1911, but many things still resonate today in the borderlands. Book info: Evangelina Takes Flight / Diana J. Noble. Pinata Books/Arte Publico Press, 2017. [author Facebook] [publisher site] Review copy and cover image courtesy of the publisher. My book talk: Pancho Villa and his rebel soldiers are coming? As big sister celebrates her quinceanera before the family flees their northern Mexico rancho, Evangelina worries about little Tomas’ recovering so slowly from a scorpion sting, whether grandfather can travel north with them, what they will find at her aunt’s house in Texas. By mule wagon, with the men herding their best cattle on another trail, Evangelina’s mother gets the children to the crowded train station, but the journey onward is anything but smooth, and the Texas border town holds no welcome for refugees. Why is wailing woman La Llorona coming into her dreams? Will the townspeople’s prejudice keep her and Dr. Taylor from saving lives? What is in the box grandfather gave her for safekeeping? Evangelina might even be brave enough to attend the town meeting where rich white people are demanding that only white children can attend the school! U = Unbreakable Code, by Jennifer Chambliss Bertman (book review) – hot book hunt or literary fire bug? an arsonist who must be stopped! Emily and James are always on the hunt for books hidden by fellow Book Scavenger fans, but when coded clues in particular volumes link up with revenge-fueled fires at listed hidden-book sites, they decide to solve the mystery… but the fire bug is watching them! Happy book birthday to The Unbreakable Code! You can read this second adventure in the series by itself, but will enjoy it even more if you get the full background in book one, Book Scavenger (my no-spoiler recommendation here). Be sure to visit the Book Scavenger game website if you want to report a found book or register a book to hide yourself – there are hundreds hidden all over the USA! What ‘lost treasure’ from a favorite author would you like to find? Book info:The Unbreakable Code (Book Scavengers, book 2) / Jennifer Chambliss Bertman, with illustrations by Sarah Watts. Holt Books for Young Readers, 2017. [Book Scavenger site] [author site] [publisher site] Review copy and cover image courtesy of the publisher, via Edelweiss. My book talk: The unbreakable code? As Emily and James seek out hidden books in the Book Scavenger game, the middle schoolers discover a secret message that sets them hunting for information on Gold Rush ships buried beneath San Francisco’s skyscrapers and the code that author Mark Twain said could never be broken. But someone with a grudge is setting fires at Book Scavenger hiding places and doesn’t want the young teens to discover the next fire site…ever. What does their teacher (and fellow Book Scavenger) know about the code – and the fires? Why must they help with the school dance now when they want work on this mystery? Ciphers, codes, clues – which ones to follow? As the fires strike closer to what’s important to Emily and James, they must decide who to trust and how far they can go on their own. Second book in the Book Scavenger series, following Book Scavenger. S for San Antonio and so many authors! – and even succumbed to the lure of acquiring a few completed books signed by authors, both brand-new and deservedly famous, despite the extra weight of hardcovers and acid-free paper. Life in the world of books and ideas and imagination is very good! But the libraries that serve us all are threatened by drastic funding cuts at the national and state level. Please, please, click on those links to find ways to tell legislators how libraries make a difference in your community and your life – it will take all our voices to change their minds. What’s your best library story? Every spring, I fret about whether I should really participate in the April A to Z blogging challenge. Can I really write 26 (great) posts in 26 (overscheduled) days in alphabetical (so structured) order? And just like every spring since 2012, I decide to take the plunge – highlighting 26 wonderful #YAlit books during April. So get ready – amazing reading ahead! When it comes to staying on my recommendation write-up schedule, the holidays are always a challenge. Then major woes with WordPress updates and borked website database… finally resolved after many, many days and phone calls. So onward into 2017 and a whole slew of books just-published and on the horizon to recommend to y’all! I’ve done lots of reading, even if I haven’t done any writing. Any upcoming titles that you are waiting for? Indies First – shop local, buy books, repeat! Saturday is Indies First, encouraging us to shop first at our local independent booksellers – and to continue shopping there during the holiday season and beyond. Check the map here for your nearest independent bookstore and take your BooksYALove wishlist with you when you shop! Prefer shopping in your pajamas? You can buy books – and eBooks – online from indie bookstores on the group website or a local bookstore found through their Zipcode search. 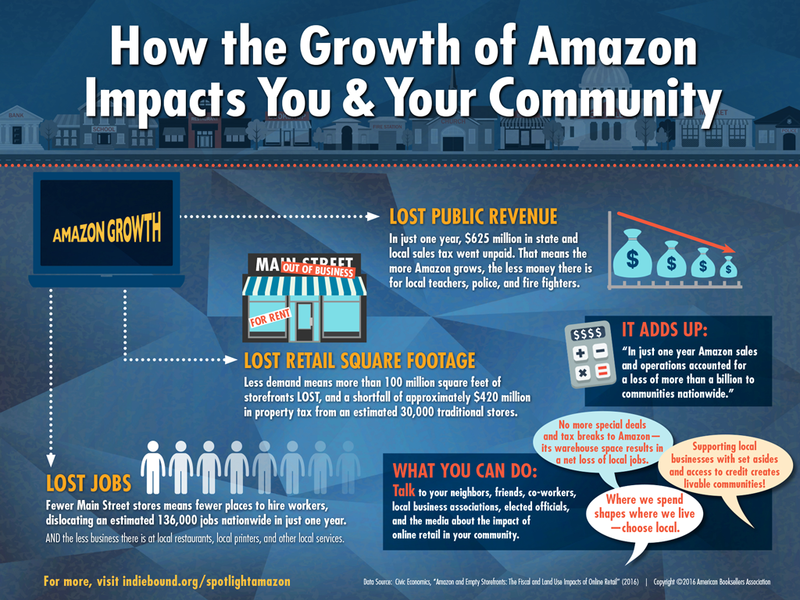 Buying largely through huge online stores truly hurts your community’s economy – check this infographic for some alarming statistics. If you are giving gift cards, remember that your local indie will sell and honor their own gift cards all year long. As always, I receive no money or goods from links – just trying to get y’all to the good stuff! What’s on your book wishlist these days? Language of Stars, by Louise Haws (book review) – poetry or pre-med prose? When is it her turn to decide? Mistakes – telling Fry about the Baylor House, trying to please Dad at work, imagining that Mom would allow her off the pre-med career path. Possibilities – writing poetry with Rufus Baylor himself, finding the ‘me’ instead of only ‘us’ with Fry, discovering her own poetic voice. So many wonderful (and on-their-way-to-better) poems in this book! Got a poem to share in the comments? Book info: The Language of Stars / Louise Hawes. Margaret K. McElderry Books, 2016. [author site] [publisher site] Review copy and cover image courtesy of the publisher. My book talk: Sarah should have talked Fry out having a party at remote historic house in their North Carolina coastal town, but after the house is terribly damaged, her dad is even angrier at her than usual, and the partying teens are sentenced to summer school plus house restoration, she is startled to find their class taught by the reclusive poet whose summer home was wrecked and that she has a gift for words, a gift that may take her far from the med school future that her mom has planned out for her. Filled with poetry – from the first written in many years by “the Great One” to those created during class together to the gems that Fry texts to Sarah while she’s working at her dad’s fancy restaurant – and revelations, The Language of Stars speaks love, second chances, redemption, and hope.